Also, become a fan at facebook.com/magpiedesignzjewelry. Here you will find the latest information on promo's, sales, new designs, deadlines, giveaways and much more! 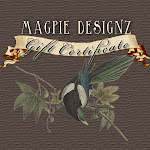 I appreciate everyone's loyalty to Magpie Designz and your support of handmade items!